CJ - Chemin de Fer du Jura operates both normal gauge and narrow gauge short-haul services in the rural alpine countryside of the French speaking Kanton Jura, close to the French border. Centers of their operations are Tavannes, Tramelan and Saignel�gier. The CJ network�s first parts were opened for traffic already in 1884. They have a network of 85 km total, most of which is 1 metre gauge narrow gauge track electrified with 1500V DC. 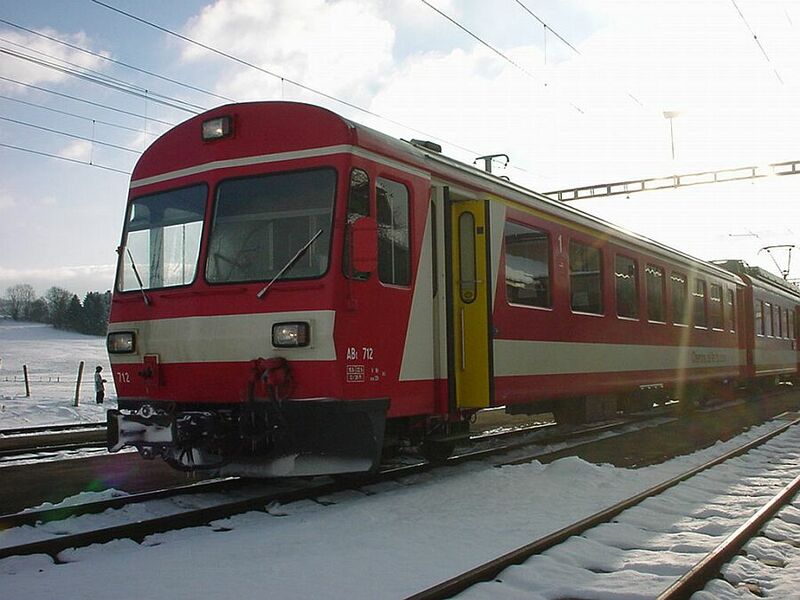 In 1999 CJ had for the narrow gauge traffic 3 electric locomotives, 1 old diesel locomotive and 13 EMUs, out of which the 1985 built BDe 4/4 II series EMUs are the youngest and most used. 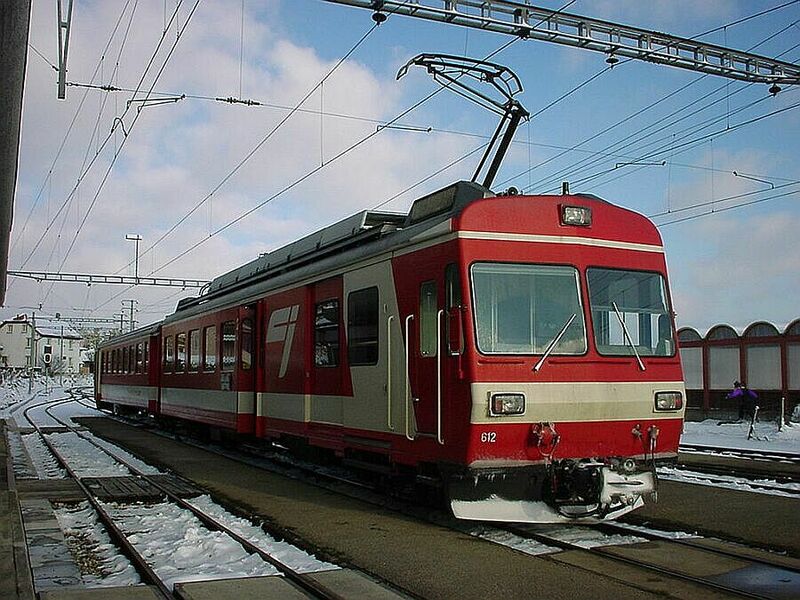 For normal gauge (1435 mm) 15 kV traffic CJ has one locomotive and two old EMU wagons. 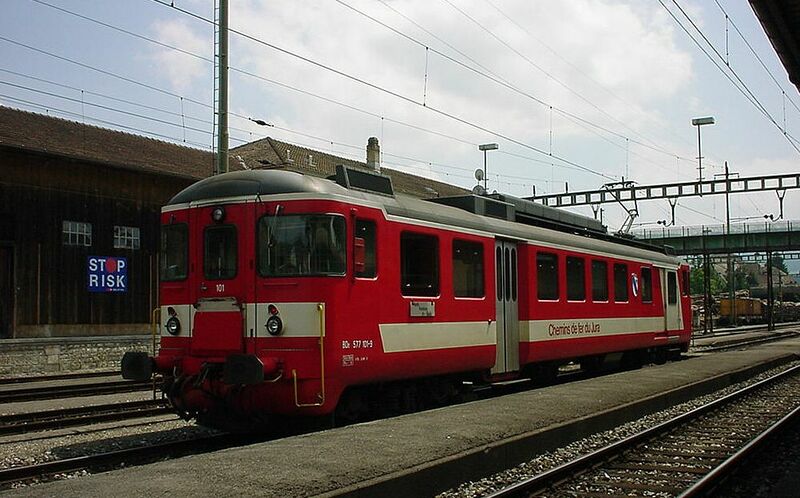 CJ, Chemin de Fer du Jura, is one of Switzerland�s many small private railroads. They have both narrow gauge and normal gauge rail lines; this is from one of their narrow gauge operations in the mountainous countryside of Kanton Jura. These BDe 4/4 electric motor units were taken into operation in 1985; CJ has four of these units. 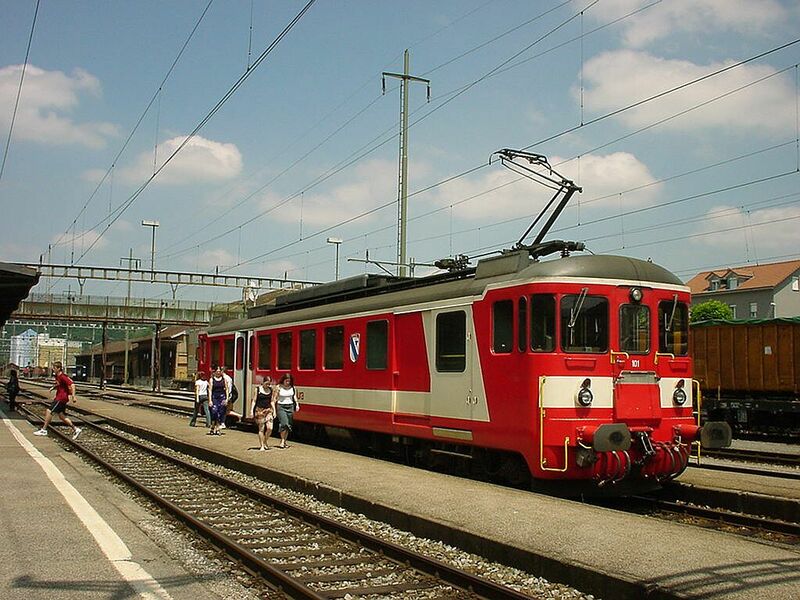 They were acquired together with AB, Appenzeller Bahn and are identical to AB�s five units. Maximum speed is 90 km/h, the EMU wagon is 18,73 m long and weighs 36 tons. The design is based on an earlier model built in 1981 for that time SGA (now part of AB), but the key difference is the missing of a cog wheel drive. Look and feel has a lot in common with the so called NPZ normal gauge EMUs of SBB and others (e.g. SBB RBDe 560). In addition to these, CJ has 12 other narrow gauge EMUs from years 1952-90. Exactly the same train no. 612 about half a year later, photographed at the Glovelier station in the burning heat of the summer. 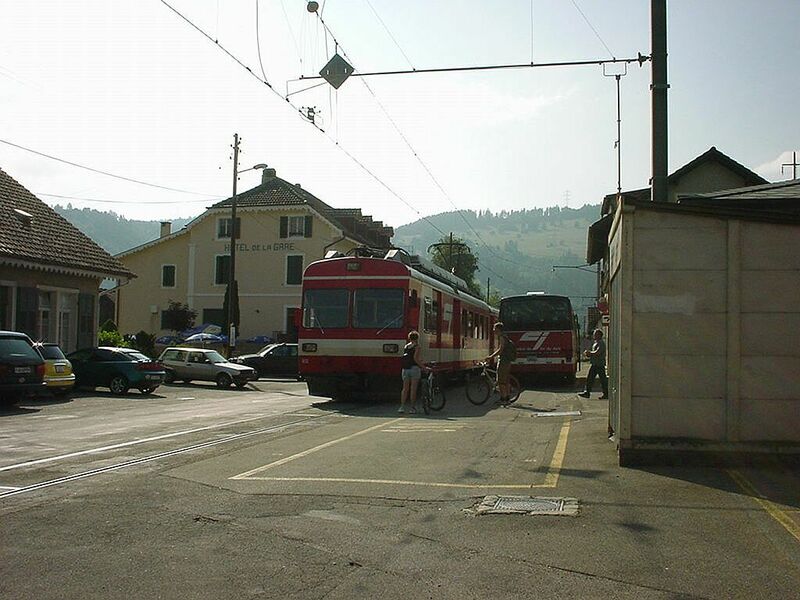 Glovelier station looks funny: the "real" trains of SBB arrive at the platforms just like at any other station, but the narrow gauge CJ trains are on the street amongst the cars and buses behind the station, between the station and the "Hotel de la Gare" (hotel station). Photo at Glovelier 22.6.2002 by Ilkka Siissalo.